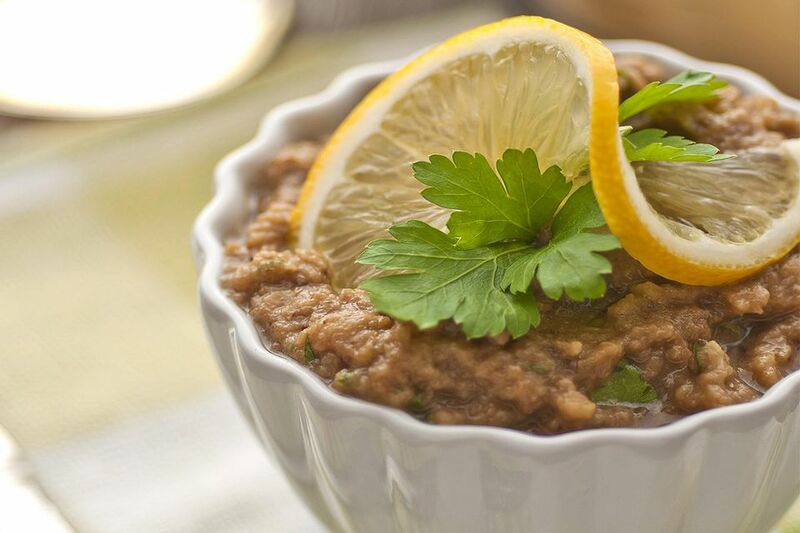 Melitzanosalata—written μελιτζανοσαλάτα in Greek and pronounced meh-leed-zah-no-sah-LAH-tah—is a delicious, traditional Greek eggplant dip. And it's versatile—you can serve it with crusty bread as an appetizer or as a side dish with meat. Some melitzanosalata recipes can get pretty complicated, but this one is fairly simple. If you're a devoted fan of the traditional, you can go the extra step and cook the eggplant over a wood fire or add wood chips to a charcoal grill. Either will result in that deep, smoky taste. This version still delivers a tasty result, and includes chopped tomatoes (fresh—do not substitute canned! ), although authentic Greek melitzanosalata typically does not. Pierce the eggplant with a fork. Char, the eggplant on a grill or over an open flame until the eggplant, turns black and is very soft. Don't rush the cooking time—eggplant can be bitter when it's not cooked through. Set the eggplant aside on a rack placed over paper towels to cool and drain. Peel the eggplant when it's cool enough to touch. The skin should come off easily by hand. Place the peeled eggplant in a bowl and use two knives to chop it. Stir in the garlic, shallots or scallions, tomatoes, and parsley. In a small bowl, mix the oil and lemon juice well. Add the mixture slowly to the eggplant, using a fork or your hands to work it in. The oil and lemon juice will separate if you just add it and stir. Season with salt and pepper. Transfer the melitzanosalata to a bowl and garnish with black olives and a sprig of parsley. If a grill or open flame isn't an option for you, you can broil the eggplant for 10 to 15 minutes. You can also bake them whole for 50 to 60 minutes or sliced for 20 minutes or so. Serve the melitzanosalata chilled or at room temperature with pita wedges, slices of crusty bread, or fresh vegetables. Melitzanosalata also goes well with salty cheeses and fish mezethes like anchovies. Add some crumbled feta to the mixture for more of a Greek touch. If you have time, place the melitzanosalata in the refrigerator for a short while before serving to help the flavors meld. For a variation, substitute red onions for the tomato. Use 1 to 2 red onions and dice them up into small pieces. Instead of parsley, substitute (or add) dill for a flavorful, herbaceous kick.